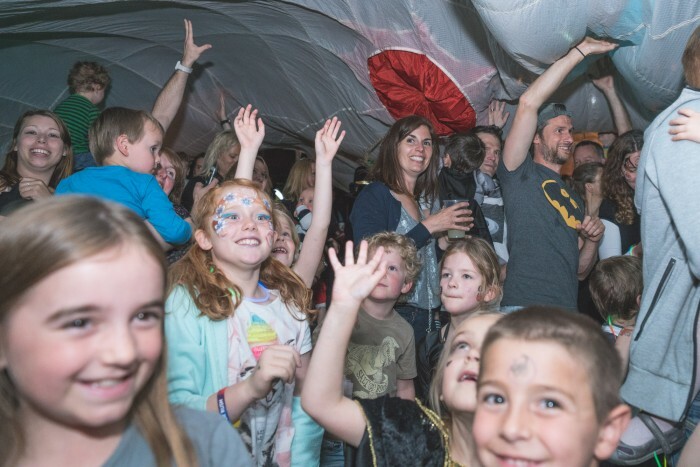 The Big Fish Little Fish crew bring their award-winning, critically acclaimed family rave to Leamington Spa for the first time. Come and get spooky with us in your Halloween fancy dress! The raves are designed to be as much fun for adults as children and are social, creative, anarchic, daft and a lot of fun for all. Rave legends ALTERN8 (Mark Archer DJ set) will be playing grown up dance music with club visuals, glitter cannons, bubbles and giant bouncy balloons. The children can get busy in our craft area making themed crafts, be artistic on our giant colouring mural, and creative at our playdoh table. There is a baby safe space with soft mats, and ball pool. Toddler play area with tents and tunnels. Free glowsticks & transfer tattoos. Licensed bar and food. Fancy Dress theme is “Halloween” – optional but very much encouraged! Face painting available too!. Come and get your rave on with us! For families with younger children (0-8 years old) though older children are welcome. Adults are not admitted unless accompanied by a child. A max of 3 children per adult. A max of 4 adults per child. Tickets are non-refundable but if anybody with tickets finds they cannot attend a sold-out event please email anna@bigfishlittlefishevents.co.uk and I will attempt to put you in touch with people seeking to buy tickets. Each member of your group must have a ticket, adults £8.50, child £5.50 and Under 1’s free (but ticketed). Will cost more on the door (if tickets available). By entering you accept that you/your children’s image and video may be used in press and publicity for Big Fish Little Fish. This is a standing/dancing event with limited seating, please contact me on anna@bigfishlittlefishevents.co.uk of you have mobility issues. Please be prepared for the event to be busy it is a rave! The event is conducted indoors with club lighting (no strobes), when entering please allow a few minutes for your eyes to adjust. Please no running!